iOS 12 is a performance focused software update, aiming to boost the usability of older iPhone and iPad models. But that doesn’t mean iOS 12 is without new fancy features too, so while the iOS 12 update may not be as outwardly flashy as some other past releases, there are still some interesting new additions and changes to the mobile operating system for iPhone and iPad users. We’re going to review a handful of great iOS 12 features that you’re likely to actually use. Let’s get to it! Selecting text has long been a challenge on the iPhone or iPad, and if you spend a lot of time writing emails, messages, notes, Pages, or in any other text editor you’ll appreciate the new virtual cursor tool that makes text selection and navigation much easier. You can also then place a second finger on the trackpad to enter text selection mode with the cursor, which then allows you to drag the cursor and select text while in this virtual trackpad mode. This is a great feature that you really should try out for yourself, as it’s much better experienced directly. 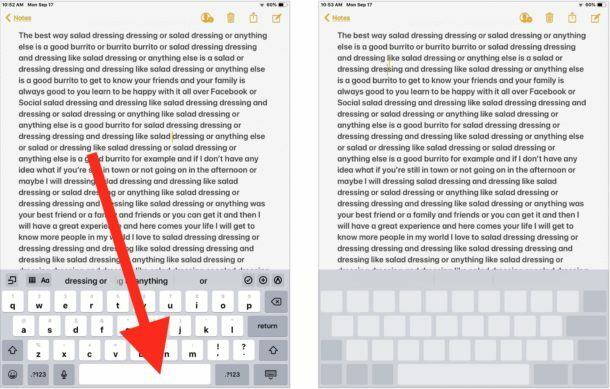 For anyone who spends much time typing or writing in iOS this is particularly fantastic, since it’s much easier to direct the little cursor around with a virtual trackpad compared to pecking on screen between letters or words with a finger or stylus. It should be noted this is not a new feature, it’s just how you access it that is new, and the number of devices it’s available on is new. Now you can simply tap and hold the Spacebar on any iPad or iPhone with iOS 12, whereas perviously accessing the virtual trackpad for text selection was available on iPhone with 3D Touch support only. Screen Time is arguably the best new feature of iOS 12. 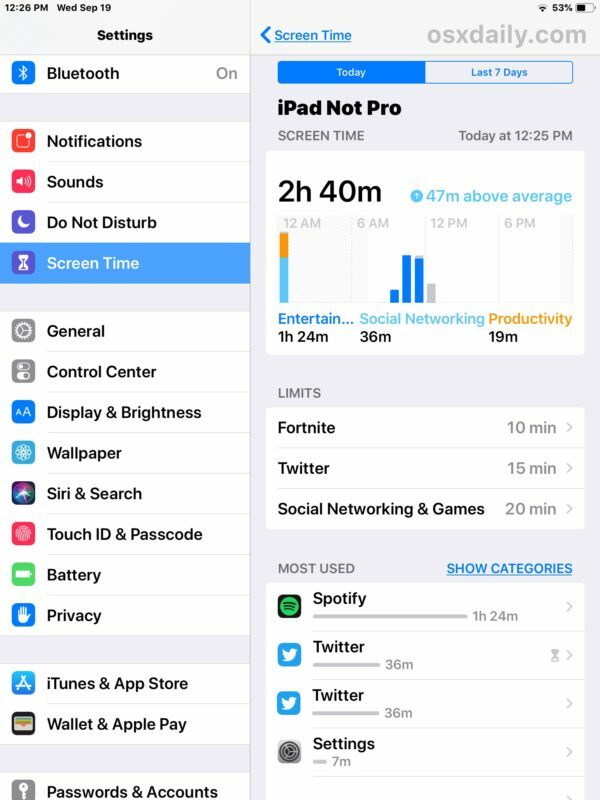 Screen Time gives you insight into how an iPhone or iPad is being used, allowing you to see exactly how much time is spent in particular apps. More importantly, you can take action based on that information and set time limits for app usage, and place other restrictions on app usage if desired. This makes Screen Time a fantastic tool particularly for parents or anyone providing child care or education, but also for anyone who wants to reduce their time wasted in any unproductive apps or detrimental device usage. Want to set a 15 minute time limit for a particular game? You can do that with Screen Time. Want to limit yourself to only 20 minutes of social media use? Screen Time lets you do that too. Once in Screen Time you can set time limits with App Limits, or even outright block an app from being used entirely, or set aside times of the day where the device itself isn’t usable through Downtime. There are also Content & Privacy Restriction settings available if you want to block adult content or otherwise limit device usage. It’s sort of like a broad self-control / parental controls feature built right into iOS, and it’s pretty great. Don’t be surprised if you look at Screen Time and discover some uncomfortable data… maybe you’re spending a few hours every day lost in the misery generating abyss of social media, maybe you discover that your kids iPad is being used to spend hours every night in a video game rather than doing homework, or maybe you find that you’re not committing enough time every day to learning a new foreign language with an app like DuoLingo and you decide you want to change that. These are examples of the type of data you can get out of Screen Time on any iPhone or iPad. By the way, for best results with Screen Time, it’s good to check it after a few days or so of device usage so that it has more data to work with. Even after you set some limits or restrictions, you should periodically check into Screen Time to see if it’s making any difference in behavior or device usage. Let’s go ahead and state the obvious; Notifications are often annoying, distracting, and rarely important. And by default just about every app on the iPhone and iPad wants to fill your device up with constant alerts and a barrage of notifications about every inconsequential event, happenstance, and useless tidbit under the sun. Do you really need to be notified instantaneously when some celebrity is on their 23rd marriage? Do you need a giant banner splashing onto your screen to inform you about creamy salad dressing in the News app? Is any of this stuff important enough to disrupt you and what you were doing with a giant notification message? Probably not. 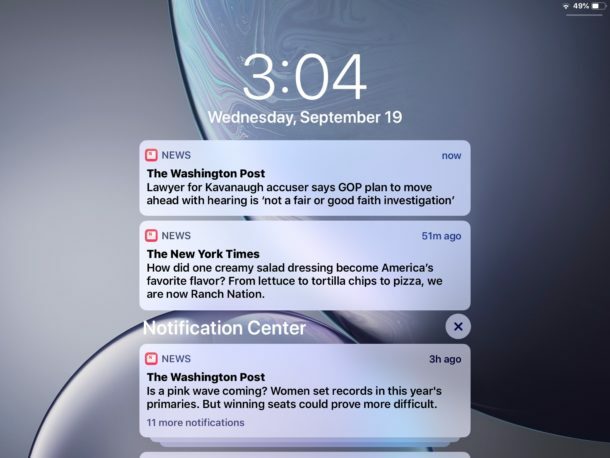 But what if the breaking news notification delivered instantly to your iPhone or iPad is about the flavor of creamy salad dressing!?!??!? Stop everything that you are doing and read this notification about creamy salad dressing!! It’s breaking news, according to the News app! But it’s kind of hard to focus when you have constant notifications bothering you, right? Did that point get across as you tried to read this section that is interspersed with that image of a useless notification? 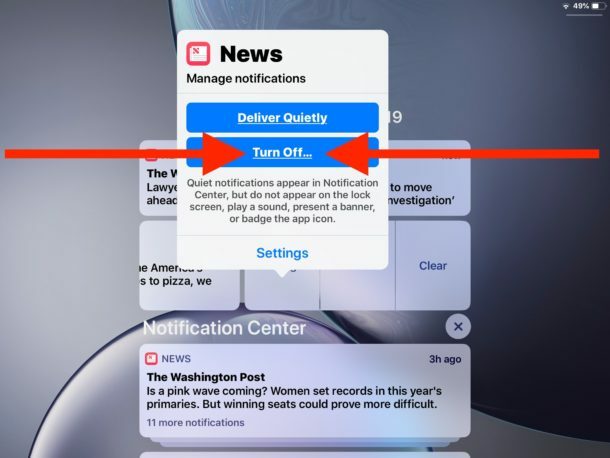 You can also choose “Deliver Silently” if you still want to see the annoyifications err notifications in Annoyification Center errr Notification Center for some reason, but choosing Turn Off is the simplest way to never see them again. And of course you can return to the Settings app Notifications section if you later change your mind. My personal opinion is that only actual communication with actual humans should be sending you notifications, things like messages and phone calls, as everything else is likely nothing more than distraction. Make your own decisions here, but focus on what is important and think critically about the kind of stuff that is splashing onto your screen to get your attention and disrupting your device use. Do you want to make sure you’re always on the latest version of iOS? Do you frequently forget to update your iOS system software? Are you tired of wandering into the Settings app to check if a software update is available? iOS 12 has a great feature that solves all of this, it will automatically install iOS updates when they’re available onto an iPhone or iPad. Just be sure that you have iCloud backups enabled so that your device is always backing up when it’s plugged in to charge. 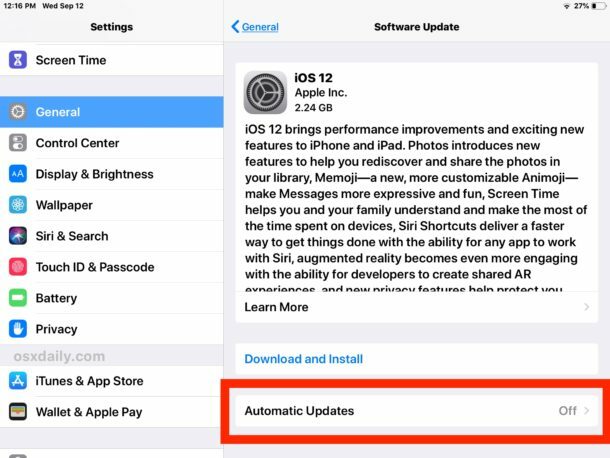 The auto-update iOS feature pairs well with automatic app updates in iOS too, allowing you a very hands-off approach to device management. The Shortcuts app (once called Workflow) allows you to create simple automation of tasks in iOS, and you can now tie those actions directly into Siri. There’s a plethora of options available with Shortcuts, you can use the feature to create animated GIFs out of Animoji or a series of images, you can use your current location to find any nearby gas stations, you can create custom replies to messages that will send someone your most recent photo taken, and so much more. If it’s a task in iOS, you might just be able to automate the entire thing with Shortcuts. Launch the Shortcuts app and explore the default and example options, and create your own. Tie them to Siri so that you can simply ask Siri to perform that task for you. There’s a lot of potential here, so if you’re a fan of automation and macros, you’ll almost certainly be thrilled with Shortcuts for iOS. Do you have any favorite iOS 12 features? Share with us in the comments below! 1. The Virtual Trackpad & Text Selection Cursor: Have not looked for it yet. it’s a small thing, but with iOS 12 Siri can now turn the iPhone torch on or off! You can turn the flashlight on or off with Siri now? Well heck this might as well be iOS 13 then! I like Screen Time, it is good for limiting app use. Notifications are HORRIBLE, turn them all off and never allow any of them. Let’s be realistic in the assessment, everything has been a minor update for years. At a feature level iOS 12 is basically iOS 7.6 with the prior main versions being other incremental updates too. What has been a new feature in the last 5 years that anyone uses? Why would screen time impact battery? It limits app use, it doesn’t do anything else. Should have no battery impact? And agree completely about turning off notifications! I’d like to see better privacy in the area of call blocking. I wish I could block whole area codes since they all originate from one, I dont know anyone there so why. Like to from the lock screen be able to slide and tap block. You can set Do Not Disturb so that it only lets callers in your Contacts through. Everything else goes to voicemail. That’s what I do now. I used to just turn off the ringer until junk callers got wise and started robo-calling numbers twice within three minutes in order to get through the call block. For me continuity camera is the only new feature that i actually use. 3. 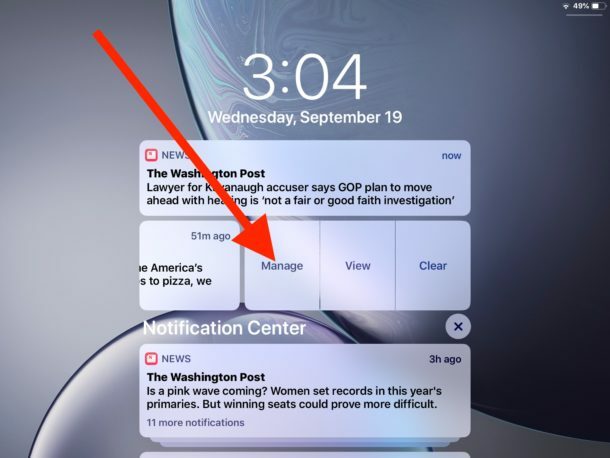 Notifications have never been a problem – apps usually ask for it on first run and i deny. The trackpad tool is brilliant- thanks- I always wonder why these features are not publicised by Apple more. The Siri ‘macros‘ feature is also potentially useful. Notifications, I wish there was a way of setting multiple app settings at once rather than having to go through all of them individually so you could turn them all off and then maybe set the one or two you actually want. 3 & 4 I am a notification minimalist anyway. The disabling of auto-update is a no brainer – only a brave soul would leave this on and run the risk with automatically installed updates. I already dislike the automatic iOS download that Apple forces upon us. 5 The one thing I wish really worked: Siri. Great, I can turn the flashlight on now. I just use Siri for very simple email composition and my Hue lights, but I look forward to this new workflow feature. Maybe I’ll compose a workflow to turn the lights on then email me when they are on. ha ha ha. I suppose I’m upgrading for the speed increase, but shall tweak the living daylights out of this OS (and desktop OS too) to disable as much of the unwanted stuff as possible. But one great thing for sure is that there’s something for everyone in this release, that’s not too bad. What older models? Surely not an iPhone 5 or an iPad gen 2. This is a joke, with more useless features clearly from the comments everyone is just turning off. Open your eyes and ears Apple, you’re not listening. So Workflow is now owned by Apple and renamed “Shortcts”? 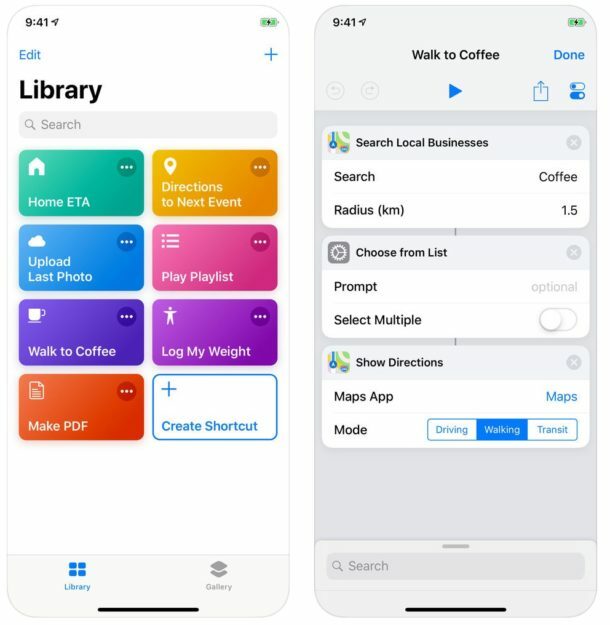 Yes correct, Workflow is now named Shortcuts and was owned by APple. Same app, same features. I am surprised it’s not included in iOS 12 too, it’s basically the biggest feature. (1) I don’t do any word processing on the iPad, because I’ve found that I can’t touch type on a flat screen. (What I do now is the h&p method.) And what if you want to actually type a lot of spaces? Do you have to do them one at a time? (3) This is the one that everyone is happy about, but I must have already done that for iOS 11. (4) A question about auto-updates is: When will they be done? If they can be done while the battery is charging, this is good. But if I open up my iPad to actually do something (such as part of my teaching), the thing I do not want to do is wait while updates download and install. (5) I never use Siri. As for features that didn’t make it to this list, speeding up app start-up looks important. Usually the speed of a machine decreases as time goes on. The keyboard is more responsive to typing, supposedly. That might mean I could go back to touch-typing on the iPad. But I still think it’s the wrong to do word processing on. Augmented Reality … Why the **** am I just finding about this now??? Trying to get a question answered but don’t know where to ask, so I’ll try here. Why did Safari delete Ad-block from extensions? They just deleted it from my toolbar without any notification. There are a few on their site but I can’t tell which is worth buying; the ones I had were free and worked just fine. What happened to iOS12 Messages Comic Book filter (and the others)? Used once, now removed.